Google has announced a new feature for the Chrome app on iOS and Android that it says can cut data usage from web browsing by up to half. The "data compression and bandwidth management" feature will compress mobile browsing data in real time as you browse, Google Software Engineer and "Data Squasher Extraordinaire" Matt Welsh wrote in a Google blog post. "In the US alone, more than a fifth of adult smartphone users now do most of their online browsing on their mobile device," Welsh wrote. "Around the world, we're seeing a similar trend towards more mobile browsing." 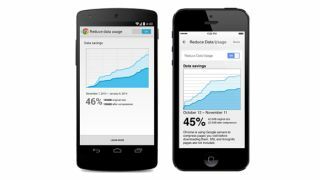 Ifso facto, Google wanted to create a way to reduce data usage and save consumers money on their mobile plans. According to Welsh, Google will be rolling the feature out to iOS and Android in updates arriving over the coming days. When the feature arrives, you can enable it in the settings menu under "bandwidth management" and then "reduce data usage." From here you can also track how much data you're saving every month with the feature. In addition to compressing web data on the fly, the feature will also enable mobile Chrome's safe browsing mode, which reportedly "helps protect you from malicious webpages." Welsh also discussed another new feature coming to Chrome on iOS in the coming days: Google Translate. The feature will work exactly as it does in the desktop and Android versions of Chrome; when the browser detects a page is in another language, it will ask you whether you want to translate it with the tap of a button. The next update to Chrome for Android will also allow users to save website bookmarks from within the browser itself with a tap of the toolbar menu. The latest Chrome browser update tracks noisy tabs.